It was just before two in the morning; the place smelled old and I wasn’t much fresher. I stood quiet and still, alone at the top of the carpeted stairs in one of the most famous Old West–related haunted houses in America: the St. James Hotel in the small town of Cimmarron. It’s in northern New Mexico not far from the Colorado state line. The historic hotel, built in 1872 as the Lambert Inn, was a prominent stopover for various gold-fevered prospectors and assorted ne’er-do-wells headed west. A parade of rooming outlaws and lawmen added to the hotel’s legend, including Wyatt Earp, Jesse James, Buffalo Bill Cody, and Annie Oakley. Jesse James was said to favor room 14, for example, and today most of the rooms are named for the gunslinging celebrity who allegedly quartered there. The two-story St. James has kept maintenance in that historic part of the hotel to a bare minimum; the wallpaper is peeling, the doors are scratched, the blood-red carpet and wooden floors are worn. There are modern rooms on the property, but if you want a taste of the Old West and to imagine what it was like to stay there in the 1800s, it’s about as close as you’re going to get. Most of the furniture is antique—or at least quasi-antique—if not from that exact era, with allowances made for modern fire code regulations and minor amenities. A large mirror sits near the top of the stairs. Despite its pocked and blistered silvering, it is in good shape for its age and has surely held the reflections of countless farriers and farmers, harlots and handymen, gunslingers and ghost hunters who roomed there. 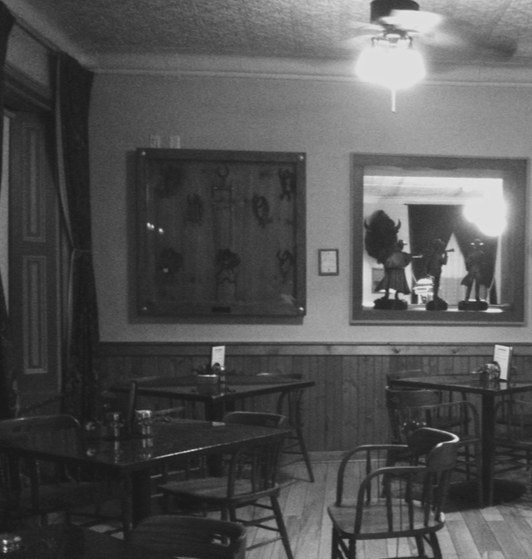 Bar area of the historic—and reputedly haunted—St. James Hotel. Photo by the author. I’d spent much of the past eighteen hours investigating the grounds, interviewing people, doing historical research at the local library, photographing the area, cataloging claims, reviewing evidence, and taking notes. I’d spent much of the past eighteen years doing more or less the same thing in dozens of other supposedly spooky locations in North America and around the world. Though approaching each new mystery with an open mind and a boyish investigative eagerness to find ghosts and solve mysteries, I had to admit, in this hotel and at this late hour, to a certain numbness, a discouraged cumulative emotional and intellectual exhaustion with evidence that never seemed to improve, no matter the location, reputation, or particulars. It’s a sea of teasing second- and third-hand stories seemingly accepted as self-evident documentary evidence, a litany of twice-told tales “confirmed” by psychic visions, “feelings,” and sciencey Radio Shack beepy things. 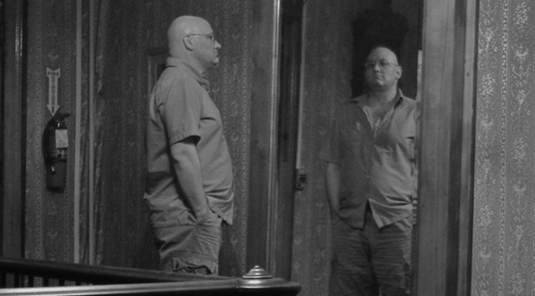 I’d seen mirrors in many supposedly haunted locations associated with some ghostly lore—though I hadn’t come across any tales at the St. James related to that particular mirror—and I’d seen cases where mirrors played a role in explaining some ghost sightings. I was curious to see if there were any odd reflections one might mistake for a ghostly image that could be created by a camera flash. I took a handful of test photos, including a few of myself in the mirror. As the sharp click of the shutter faded and the flash burst slowly left my eyes, I met my mirrored gaze and grew, pardon the word, reflective. I’d paced the decaying halls for an hour searching for any unusual or (seemingly) supernatural phenomenon. As my mind wandered, I wondered what I should look for. I’d read and heard about specific scary events at the St. James (of varying degrees of credibility), but none had manifested themselves to my skeptical eye or equipment. Many of those ghost stories were anonymous anecdotes from a time before the area had electricity—century-and-a-half-old reports of ghostly goings-on, vengeful spirits, and murderous mayhem, all clearly rooted in folklore. I wondered what would genuinely frighten me. As a longtime movie buff (and the director of two short films), I have developed an eye for how directors and cinematographers frame their shots. TV and film scenes are a series of carefully composed images. A scene’s lighting, camera angle, color, actor blocking (positioning), focus, and many other elements are carefully considered and chosen to achieve a specific effect and reaction from an audience: suspense, surprise, humor, and so on. It was likely much easier to be scared in the years before the light of science chased the shadows from the dark corners of the world. Our (Western) forefathers lived not so long ago in a world populated by unseen malevolent spirits such as fairies, vampires, and witches. Fear has its roots in the unknown, and as more and more is known about the world around us (ranging from mapping remote lands to understanding germ theory), it stands to reason that the world becomes less and less frightening. Fearsome monsters once rumored to roam South America and Africa or lurk in the murky depths of the oceans are now known not to exist. There is of course a cryptozoology-influenced middle ground, but most modern monsters are all too human and largely created by the news media: school shooters, candy-bearing pedophiles, foreign terrorists, and so on. We have become passive consumers of other people’s interpretations and depictions of what we fear—or are expected to fear—and much of that is visual. Haunted hallway in the St. James Hotel. Photo by the author. This careful staging for visual clarity and maximum effect is most obvious in scenes where actors are sitting around a dinner table and are carefully positioned so that none have their back fully to the camera or are blocking other actors. Once you begin to notice it, it’s hard to miss the family or group unnaturally sitting around a table in a C-shaped semicircle so that the camera can see what they’re doing. By recognizing (and trying to strip away) the artificial cinematic conventions of ghosts, demons, and the supernatural from our expectations about the real world, we can try to imagine what a genuinely supernatural experience might be like. There is no reason to expect that genuinely supernatural creatures or entities would hew closely to our mass-media-mediated expectations of them. As I stood at the top of the stairs, I tried to picture what I might see in the mirror in one of the region’s most famous haunted houses that might startle or frighten me—something that would nudge the needle of my internal Skeptometer into the Believer zone, no matter how slightly or briefly. Like many people, I endorse the famous X-Files phrase “I Want to Believe.” I do want to believe—but more so I want to know; belief by itself is cheap, as cheap and transient as doubt. What’s important is understanding the reasons and evidence that make a claim plausible or dubious. I wanted something real, something profound and soul-shaking and unmistakable, to occur. Not some later-noticed and tortuously enhanced small flash reflection orb in the corner of some photo, one mild “anomaly” among hundreds. Not some ambiguous dark blur or “shadow figure” whose origin as a long exposure is obvious to photographers and skeptics (but apparently few others). No, I wanted something real, something both intellectually and emotionally compelling, something I hadn’t seen dozens of times before. Something that would make me question reality, make me doubt my experience-informed, science-based, heretofore generally negative conclusions about the quality of the evidence for ghosts. Still, as my heavy-lidded gaze slowly shifted from spot to spot around the mirror, changing focus in the sickly yellowish glow cast by hallway light bulbs, a few visions came into my head. Bloody Mary was the most obvious, the most famous mirror-based ghost story. I pictured her suddenly appearing in the silvered gleam and reaching out toward my face with the classic, dramatic cliché of a pallid outstretched hand and filthy, cracked nails preparing to exact revenge upon the living—me, in this case, I assume—for daring to summon her. Or maybe, I mused, like the Hispanic ghost La Llorona—and as in Kubrick’s The Shining—she’d appear as a beautiful woman before suddenly turning terrifying. Or would the ghost be closer to Sadako (Ringu), the long-maned Japanese girl who might climb out of the mirror and slowly, inexorably crawl toward me over the worn wooden floor in muted blue cathode-ray light of unknown origin? I sought a pure, genuinely foreign experience, something unmistakably supernatural that could not be the product of a tired mind, a mild hallucination, or a half-forgotten memory of a scary film scene. It makes sense that our primal fears draw from our familiar bodies and lives, of course; Stephen King understands this and has mined deep fears from the ordinary for decades. If cats feared ghosts, those feline phantoms would surely have tails and walk on all fours; a cat skull—not a human one—would haunt their fervid nightmares. No matter how deeply I mined my memories or imagination, all the scary, ghostly images I could conjure came from movies: the swarming luminous semi-transparent skeletal wraiths in Raiders of the Lost Ark; the creepy demonic face pushing though a flexible opaque fabric on the poster of Peter Jackson’s The Frighteners; the glimpse of a homeless subway rider’s rat-like tail in Jacob’s Ladder; and so on. Over and over when I tried to picture a real ghost, a genuine spirit of the undead, I drew not from my own personal subjective fears or experiences but from those of other people—and even those were not genuine but completely artificial computer-generated images carefully rendered and constructed by talented visual effects artist strangers. They didn’t know me; they didn’t know my personal fears. They were creating and dispensing memetic fear widgets that I had absorbed and internalized. These were not organic fears summoned from the depths of my dark unconscious. These were images created commercially by humans specifically for the purpose of scaring other humans—often using tired tropes such as skeletons (which honestly have never scared me; bones don’t frighten me because they prevent me from collapsing in a soft fleshy lump). Those were the obvious Hollywood camera-friendly ghosts. But in my years of investigating, I’d never seen anything even close to resembling those. 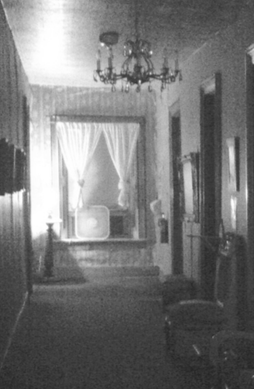 The best “ghost” videos were either fakes (occasionally clever but more often fairly obvious) or so ambiguous as to be close to worthless (reflections in windows, unnoticed long exposures, and so on). There’s no bell curve distribution to quality ghost evidence; instead it’s more of a pyramid shape, with the vast majority of ghost photos being of very poor quality, and the most compelling mysteries very rare. I watched and waited, studying my reflection. I was tired. I felt as old and faded as the wallpaper. I felt each minute standing silently in front of the old mirror. I felt each hour at the hotel. I felt each year doing the same investigations at dozens of places just like it, looking behind closed doors for spooks that weren’t there. The search for some ghostly sign, the interviews with believers, the countless fruitless photos and videos and Rorschach EVPs—all that seemed to amount to nothing more than sound and fury: a handful of shadow, a fistful of rain. As those thoughts lazily wandered through my mind, I returned to the moment and focused on my reflection again. I sighed and finally gave up. There was nothing for me here or anywhere else I searched. I decided to end it. I was done. I took one last long look in the silver-pocked mirror on the second floor of the haunted St. James hotel and went to bed. Despite a lumpy bed in an old hotel, I slept better than I had in years.